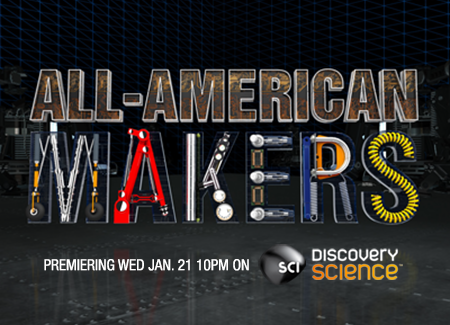 America’s do-it-yourselfers, innovators and entrepreneurs are getting the opportunity of a lifetime – to turn their big ideas into big money on Science Channel’s all-new series ALL-AMERICAN MAKERS. Every week four top makers from around the nation pitch their products to a panel of three experts featuring Printrbot founder and owner Brook Drumm, mechanical designer and robotics expert Brian Roe, and venture capitalist Marc Portney. Each maker’s homegrown product is put through a series of rigorous tests by Drumm and Roe to find out how it works and if it lives up to its claim. Should the product make the grade it’s then subjected to the scrutiny of real consumer focus groups. Based on the feedback of Drumm and Roe, the focus groups and industry experts, Portney decides if he wants to invest his own money in the maker’s business and help bring the product to store shelves. From dog toys, thermal radar and grill gadgets to personal robots, hybrid recreational vehicles and stain repellent, the products featured on ALL-AMERICAN MAKERS span the everyday to the amazing. If you are a maker or inventor you can submit your product for consideration here.